Church of Scientology Celebrity Centre International’s Gala draws artists, social and human rights leaders: Kate Ceberano with the Golden Era Musicians. Just one look at the decor throughout the grounds of the historical landmark made evident that this was no ordinary black tie evening in Hollywood. 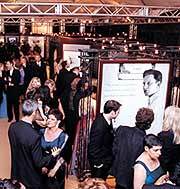 Indeed, a look at the guest list — an eclectic gathering of 1,200 celebrities, industry professionals, local and federal politicians, and leaders of groups as diverse as South-Central’s First AME Church and the Navajo Nation — showed it to be an extraordinary night at the Church of Scientology Celebrity Centre International. Celebrity Centre is a unique church for artists and others in the film, TV and music industries, as well as business and sports figures. It was created especially to help such individuals, as they are cultural and societal leaders. Many credit the church with helping them to start up or revive their careers, and to maintain steady success. Eric Garcetti presents proclamation from the L.A. City Council to Susan Watson, President, Church of Scientology Celebrity Centre International. While it is no secret that the Scientology religion is embraced by some of Hollywood’s biggest stars, members attending the 33rd anniversary gala in addition to Tom Cruise were representative of the lengthening roster of newer and younger generation artists who are involved. They included Jason Lee (Almost Famous, Vanilla Sky), Erika Christensen (Traffic, Swimfan), Giovanni Ribisi (Saving Private Ryan, Gone in 60 Seconds), Christopher Masterson (Malcolm in the Middle), Lynsey Bartilson (Grounded for Life), Marisol Nichols (Resurrection Blvd), Pablo Santos (Greetings From Tucson), Juliette Lewis (Enough, The Other Sister), Catherine Bell (JAG) and Michelle Stafford (The Young and the Restless). The anniversary gala included live entertainment from Grammy-winning composer and musician Mark Isham, singer Carl Anderson and Australian recording artist Kate Ceberano, accompanied by the Church’s Golden Era Musicians, and the big band sounds of the Howard Mac Orchestra. "We place a great deal of importance on the artist in society, because they spearhead the culture and fashion the world,” said Celebrity Centre International president Susan Watson, who opened the evening’s event. To counter the onslaught of drugs, “free love” and other immoralities that besieged youth and many artists in the 1960s, Scientology founder L. Ron Hubbard, a prolific author and accomplished artist himself, set out to provide an oasis where artists can learn to flourish and prosper without the vagaries of public life, and use their talents to teach, uplift and entertain. Tom Cruise, Georgia Gilman, Erika Christensen and U.S. Representative Ben Gilman. Scientology is a practical religion comprising a vast body of knowledge and discoveries about life, including basic and empirical principles of the human spirit. The word itself comes from Latin “scio,” to know, and “logos,” study — and literally means “knowing how to know.” Its practice consists of study and individual counseling, with exact procedures to help a person to increase understanding of his own spiritual nature and potential, his relationship with others, and with life itself. The religion is not dogmatic, even with respect to the Supreme Being, which it embraces but does not define for the individual. Rather, Scientology provides knowledge and the means for the individual to come to know for himself, and practical help he can use to improve his own life and the lives of others. "The spiritual and practical emphasis of Scientology has a particular appeal for artists, who tend to be quite spiritual themselves,” said Greg LaClaire, Vice President Public Affairs for Celebrity Centre. The religion’s popularity with artists, Church officials said, mirrors the overall growth of the religion. Scientology today is found in 154 countries, with a current rate of more than a half-million people participating in introductory services in churches worldwide each year. The Celebrity Centre International in Hollywood also guides the activities of 11 related Celebrity Centres including in New York, Nashville, Las Vegas, London, Paris and Vienna. Grammy award-winning musician and composer Mark Isham. Like other Churches of Scientology, the Celebrity Centres provide the courses and spiritual counseling central to the Scientology religion and its sub-study, Dianetics. However, they also offer additional services that minister to artists and leaders, and an atmosphere to cultivate their creativity. Members donate their time and expertise to help other up-and-coming artists with workshops on breaking into and making it in different aspects of the industry. They organize art exhibits, acting classes for children and adults, and provide seminars to the community. They also organize projects where they can use their talents to make a difference in society. SPECIAL EXHIBIT: Guests toured an exhibit on the life and legacy of L. Ron Hubbard — author, philosopher, humanitarian and founder of the Scientology religion — featured at the Celebrity Centre’s 33rd anniversary gala. The 40-panel, 250-photo exhibit provided an overview of his early life, including accomplishments as aviator, explorer, master mariner, photographer and other professions — quite in addition to his primary calling as author that would make him a household name in the 1930s. All the while, he pursued the research he set out to accomplish as a teen: find out what makes man the way he is, and especially what makes him unhappy and troubled. The exhibit depicted Mr. Hubbard’s discoveries about the mind, first released broadly in “Dianetics: the Modern Science of Mental Health” in 1950. It showed the development of his research on the human spirit, and the basic principles, scope and impact of the religion today throughout the world. It also explained how discoveries Mr. Hubbard made throughout his research, such as causes and solutions for drug addiction, criminality and illiteracy, were adopted by social betterment groups and put to use in the secular arena. These include hundreds of groups worldwide affiliated with the Narconon drug rehabilitation program, the Criminon program for reforming criminal offenders, the Applied Scholastics education network, and The Way to Happiness Foundation for restoring moral values. Far from a quiescent retreat, Celebrity Centre International is “a hub for community activism and contribution from artists who want to do something about the conditions in which they live, not just for them, but for everyone,” said president Susan Watson. As a 30-year member of the House International Relations Committee — including as its chairman from 1994 to 2000, and currently as chairman of its Middle East and South Asia Subcommittee — Rep. Gilman has dealt directly with the world’s most pressing human rights concerns. "From the outset, you saw that the rights of others were equally as important as your rights, and that an erosion of anyone’s rights was an erosion of all,” he said, referring especially to the work of artists and other Scientologists to protect religious freedom and human rights. “You were protecting all of us, and the way of life that we hold so dear here in our country. "I commend the parishioners and staff of the Church of Scientology for all of their dedication to human rights and for paying the price of freedom. In these trying times our debt of gratitude to you is greater than ever,” he said. Artists and leaders at the Hollywood center are engaged in a gamut of social causes, including drug rehabilitation and prevention, literacy, offender rehabilitation, human rights and the environment. Heber C. Jentzsch, President, Church of Scientology International. Centre staff and members organize charity events throughout the year, including the annual “Christmas Stories” to benefit the Police Support Association and the Hollywood PAL [Police Activities League’s] programs for children, the Boy Scouts, the Hollywood Beautification Team, and the Hollywood Arts Council. They contribute resources and talent to community endeavors, such as the annual “National Night Out,” and sponsor activities like Kids on Stage for a Better World. Celebrity Centre International also makes its event facilities available for public use, hosting more than 1,000 community events on its premises in the preceding 12 months. Celebrity members of the Church support and participate in literacy programs — including the Hollywood Education and Literacy Project (H.E.L.P.) and the World Literacy Crusade — helping youth and adults to live worthwhile and productive lives; in the Narconon drug rehabilitation program that has successfully freed tens of thousands from addiction; and much more. "Scientologists are active in community and social betterment and human rights because reaching out to help others is an integral part of their beliefs,” said Heber Jentzsch, President, Church of Scientology International, who spoke at the Celebrity Centre anniversary gala. In support of this fact, LAPD Hollywood Division’s Captain Mike Downing and City Councilmember Eric Garcetti both presented certificates to the Celebrity Centre on the night of the 33rd anniversary gala, recognizing their unconditional and continued support to the community. Hollywood Division LAPD Captain Mike Downing presents award to Susan Watson, President, Celebrity Centre International for the Church’s contributions to the city. “Your partnership with LAPD Hollywood Division has been one of contribution making a difference in the quality of people’s lives. In actual fact, yours is one of the most authentic partnerships I’ve experienced,” said Captain Downing. Celebrity Centre International has earned hundreds of recognitions and awards for the contributions of both the center and its artists to the community. Among many diverse examples in Los Angeles are literacy programs, a 10-year involvement with the Hollywood Police Activities League, and cheerful murals in the waiting areas of 28 county facilities for abused and abandoned children, as well as in Hollywood High School, all contributed by Celebrity Centre artists. Celebrity Centre International has been located since 1974 in the former Chateau Elysee, a replica French chateau built in the 1920s by the widow of movie mogul Thomas Ince, and home away from home for many of the industry’s top names of the 1930s and 1940s.